Fans of The Simpsons thinks they’ve stumbled across a dark Easter egg that’s been sitting right under our noses for the last 649 episodes. 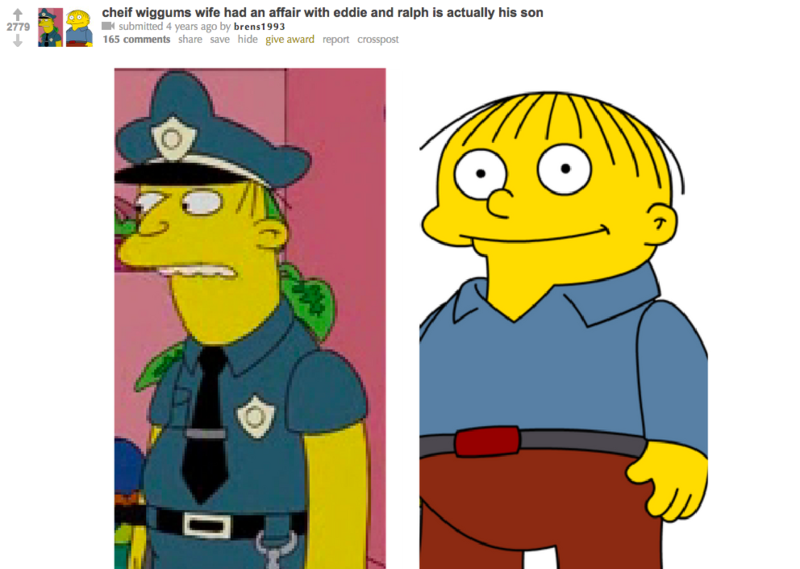 Keen-eyed fans on Reddit noticed an odd similarity between Ralph Wiggum and a member of Springfield’s police department, scandalously though it’s not his father Chief Wiggum. Instead it’s Officer Eddie, one of Wiggum’s bumbling detectives, who seems to share Ralph’s distinctive hair under his hat. The theory goes that Wiggum’s wife, Sarah, had an affair with Eddie that led to little Ralphie. Chief Clancy Wiggum being thicker than two short planks never noticed the similarity between his ‘son’ and Eddie and Sarah let him believe Ralph was his son to save him the embarrassment. It’s a fine theory for Reddit but we here at ‘UNILAD Investigates!‘ like to go above and beyond when we write these articles, by which I mean we check the relevant Wiki. 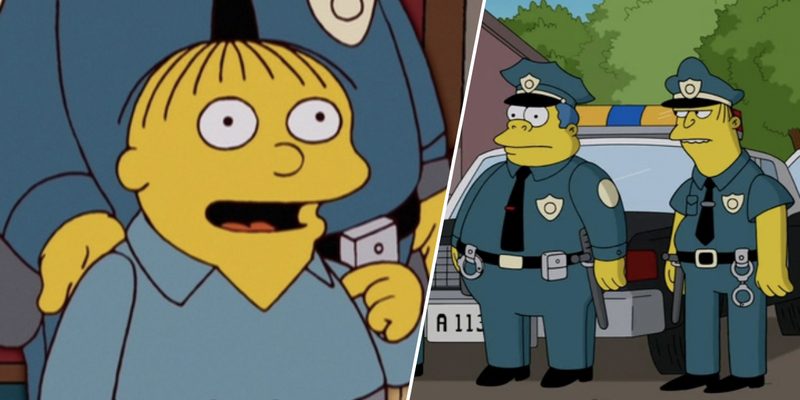 In the episode Holidays of Future Passed, we flash forward 30 years in the future where Bart’s pulled over by a 38-year-old Ralph who’s now working as a cop. In that scene we see that Ralph’s hair has now thickened out and turned blue, suggesting he is indeed Chief Wiggum’s biological son. Furthermore we surmise from previous episodes that Ralph’s ‘line hair’ is supposed to indicate he has a thin head of hair as a child. We know this because that’s how balding character’s are depicted in the show. For example Homer’s iconic two semi circle combover and, more tellingly, Eddie’s hair cut. You see Eddie doesn’t wear that hat because he’s a dutiful officer, he wears it because he’s secretly ashamed of his thinning hair and male pattern baldness which is revealed in season 29’s Homer Is Where the Art Isn’t. Call me mother f*cking Colombo because this one’s solved. Case closed! Bake ’em away toys! Now if only I could solve the mystery on why I still watch The Simpsons, after all the show’s been past it’s prime for awhile now. Don’t take my word for it though there’s a graph to prove it. I re-watched The Simpsons and charted its decline. 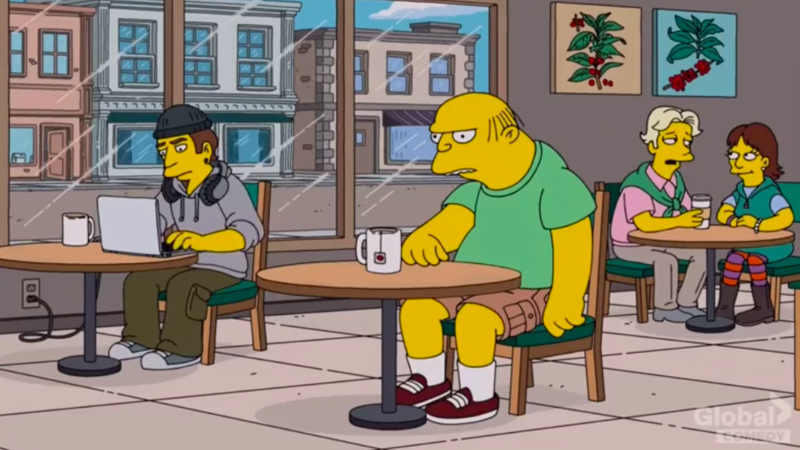 According to Sol Harris, who watched every episode and charted the shows slow decline began after season six but The Simpsons managed to retain some degree of quality up until season 10. From there the show went into a catastrophic tailspin from which it’s only recovered from once in 2007, when the movie came out. Sol’s graph makes for some sobering reading actually, revealing the show now has more bad episodes than good.